When a young Jackpot Capital Casino welcomes players from all over the world. Today, one of their happiest players is in Sweden. Actually... he's probably in Spain by now! When the 28 year old Swede had an incredible $36,034 winning spree on the classic Sevens & Stripes slot game recently, the first thing he thought of was sun and sand. 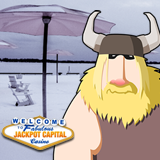 Rasmus L is a regular at Jackpot Capital but said he’s never had a winning spree like that before. “I wanted to do something special for my girlfriend so I’m taking her to a beach in Spain for some fun in the sun!” he said. Swedish slots player will take girlfriend to Spain for some sun. The lucky Swedish slots player said he doesn’t really have a favorite slot game but usually plays new games a lot when they first come out. He loved the “Morphing Symbols” in the candy-themed Sweet 16 that made its debut last month. Sevens & Stripes is a classic slot game with a vintage Vegas feel to it. It’s a simple, single payline game with good old sevens and red, white and blue bars spinning on its three reels. Players can bet as little as a nickel or as much as $45 per spin. Jackpot Capital is known for its generous casino bonus giveaways, like the current $130,000 Welcome to the Future bonus event. Frequent players are winning up to $800 each every week and even occasional players are winning in weekly random draws for another $5000. There are hundreds of online slots and casino games like Blackjack and Roulette in its online casino for desktop and laptop computers. Its most popular games are also available in its mobile casino for smartphones and tablets.